The Friends of the Scranton Public Library Series collection in the Lackawanna Valley Digital Archives contains images of original posters. 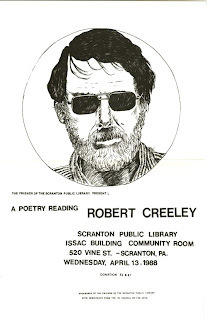 The posters were drawn by Carol Gargan, an artist, poet, and retired educator, based on photos of the poets. Thank you to David Elliott who retrieved the posters from his personal archives and to Ms. Gargan who gave us permission to scan them and make them available. 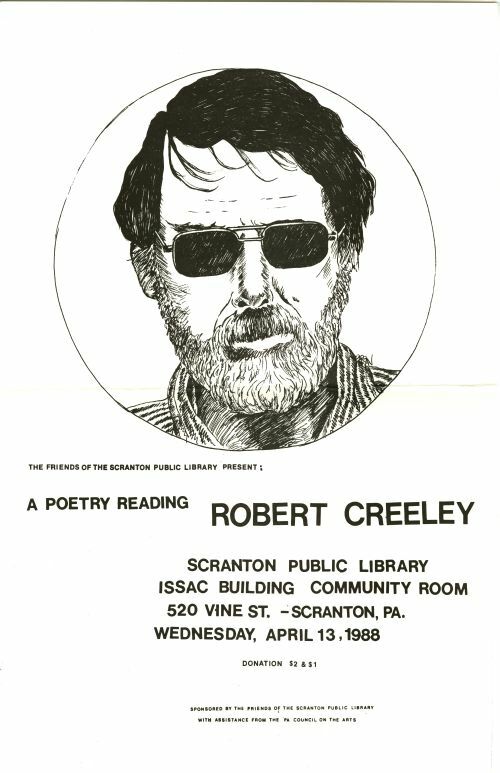 This poster is from Robert Creeley's reading which took place on April 13, 1988. These days Carol can be found tending the Kosciuska Healing Garden where East Market Street meets the Lackawanna River in Scranton.